From Comoros Islands, An Olympian Clears Hurdles On And Off The Track : The Torch A competitor in Rio grew up poor in the islands, leaving home to live on the streets when he was 8. There's not even a running track there. Now he's competing in the 400-meter hurdles. 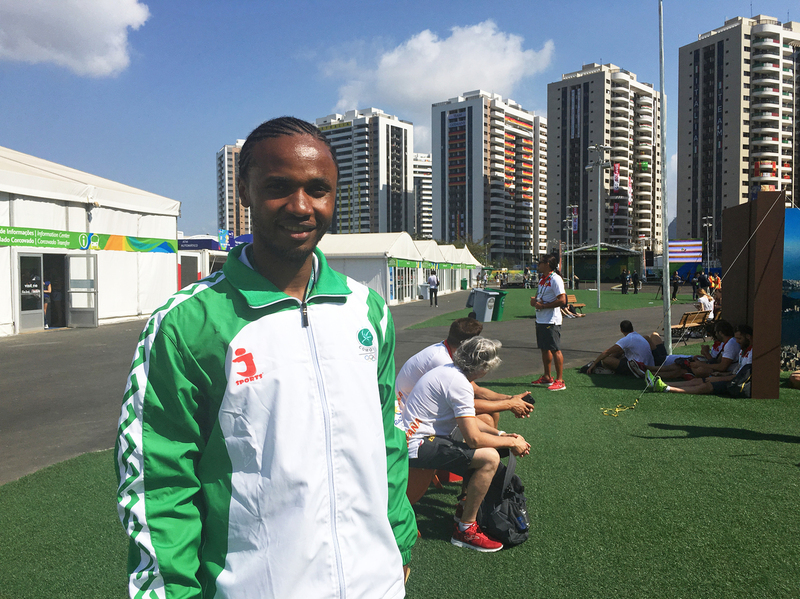 Maoulida Daroueche of the Comoros will compete Monday in the 400-meter hurdles. Daroueche, 25, had a tough life as a kid in the Comoros, but now resides in France and is competing in his second Olympics. "Each athlete has his own story," he told me. "So this is my story. Voilà!" Daroueche is one of just four athletes competing in Rio from the Comoros, a tiny Indian Ocean archipelago off the southeast coast of Africa. "We are a small country," Daroueche says, "so we need to show [our] best, to give the best part of us, even though we don't have the really, really high level. We need to show the world that we exist also." Daroueche, 25, will compete Monday in the 400-meter hurdles. His best time in the event wouldn't be fast enough to qualify him for the Olympics, but each sport allows slots for top athletes from small countries. "Deep down inside me," he says, "no matter what I do, I can't forget where I come from." This is the second Olympics for Daroueche; he competed in London in 2012 and was eliminated in the first round. It's a remarkable achievement for anyone, but especially so when you consider the obstacles that once stood in Daroueche's way. For starters, in the Comoros, there is no track to practice on. Instead, as a child, he would go outside and run for miles on the beach. "As a Comorian," he tells me, "the easiest thing is to run long distance, because you don't need equipment. You can just run." For Daroueche, maybe running provided a way to escape a difficult childhood. He gets a faraway look when I ask him about his life growing up. "My childhood?" he replies. "That's a part of my life that I try to forget." But bit by bit, his story comes out. Daroueche tells me he doesn't know anything about his father. "He was never there when I needed him. For me, it's really sad. But," he shrugs, "it doesn't matter." His mother had eight children, two of whom died young. She was struggling to raise the rest on her own. Daroueche was the oldest, and he left his home when he was just 8 years old. "You just learn how to manage on your own," he says. His main goal each day was to find something to eat and a place to sleep. "Where I come from," he says, "you really don't need a house to sleep in. So we slept everywhere." He would forage for food in the fields. His running prowess got him noticed. He won cross-country races in school, and when he was 15, he got a break that would change his life. A gym teacher offered him the chance to go live and study in the south of France: a country that Comorians imagined as El Dorado. Daroueche took that chance. A French family took him in. In France, everything was different. He no longer had to scrounge for food. He wasn't hungry all the time. In school, he started running track, and this young man who had overcome so many obstacles found he excelled at hurdles. He pushed himself through high school and college "to assure my future," he says, "and so my children don't have the same life that I had." Still, life as an immigrant in France was hard. He battled constant visa problems. Everything was expensive. To pay the rent, he found jobs as a deliveryman and a garbage collector. Sometimes, he'd work until 4 in the morning and have to be at school just a few hours later. With such a punishing schedule, it was hard to find time to train in his sport. But he persevered. "It builds character," he tells me. Now, this Comorian who has built a new life in Salon-de-Provence, France, has earned his master's degree in computer science and won a spot in the Olympics. "That's why I'm really, really happy to be here," he tells me. "Because every time I think about what I have done before to come here — even though I'm not one of those in the hunt for a medal — knowing everything I've gone through, just to be here is already a victory."